It has felt amazing to get back out running these last couple of weeks; it’s pretty much the only time when I'm alone with my thoughts! A couple of years ago, after reading reviews and trying them on in-store, I bought my first pair of Mizuno Wave Prophecy runners and they are awesome. I have cranky feet (bunions, etc.) 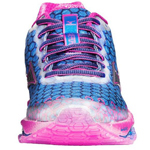 and these shoes are wonderfully lightweight and supportive (and colorful!). I bought my second pair last fall and am eyeing these colorful new models when it's time to replace my current pair!